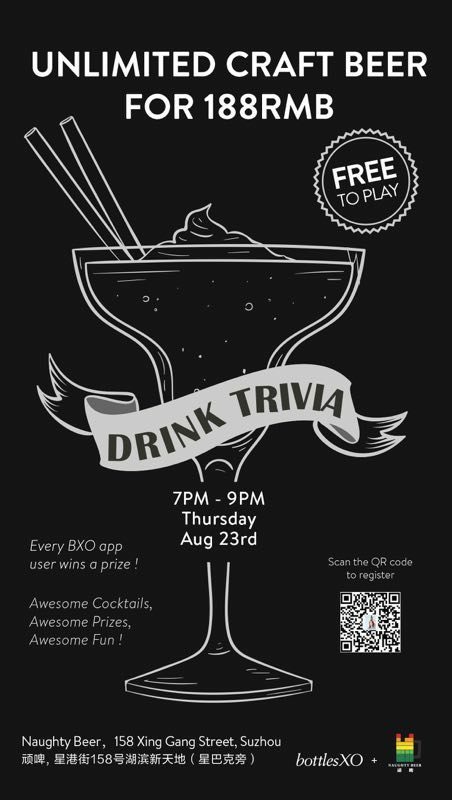 Join us for a night of free-flow craft beer and drink trivia on Thursday, 23rd August at Naughty Beer! The theme of the night is the most fun of all – drinks! Teams of three to four will compete to win a grand bubbly prize. Best of all, every team participating will receive a complimentary gift. If you feel like indulging in one of Suzhou’s finest selections of craft brews, pay just ¥188 for for free-flow beer! There will also be a selection of awesome cocktails available. Scan the QR code on the flyer above to register. Get a range of craft beers delivered chilled to wherever you are in Suzhou or Shanghai. Click here to download the BottlesXO app and start ordering.